Viewing time: 4 min. 34 sec. The Write Question is a weekly video podcast all about writing. 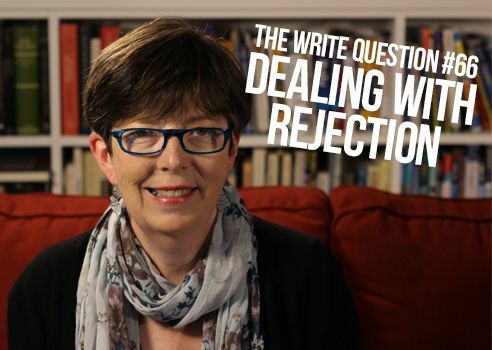 Today’s question focuses on dealing with rejection. If you have a question you’d like me to answer, email me at daphne@publicationcoach.com, tweet me @pubcoach, or leave a message for me at the Skype account, The Write Question. Oh, my heart goes out to you, Tracy. Dealing with rejection is difficult and the more sensitive you are, the harder it is. So let me try to give you some advice. Part of the issue is that you are probably taking the rejection personally — as if it’s an evaluation of your character, or your intelligence or your writing ability. It is NONE of these things! It’s simply one person’s reaction to your work. Remember that people are allowed to like or dislike any piece of work. But there are more than 7 billion people in the world. Don’t let one person’s reaction cause you to give up on the other 6 billion, 999 million people! As for how to feel better, let me give you some more specific advice. First, let yourself feel disappointed. Negative feelings never dissipate if you squish them down and try to ignore them. We all deserve the chance for a brief pity party. Just don’t let it turn into a pity month or pity year. Instead, focus on something else that gives you joy. It needn’t be writing, either. When I’m feeling down, I like to read. And, this is probably going to sound weird, but I also like to clean a cupboard or reorganize a drawer. No one is going to reject me for doing these tasks and I’m going to feel very satisfied. Find a job that will do the same for you. Here’s another tip. It will require a bit more planning in advance, but always have more than one writing project on the go. That way, if one project is rejected you already have another writing job that is underway and that carries its own momentum. Here’s yet another tip that will also require advance planning. Explicitly TRY to get rejected. American poet Brett Elizabeth Jenkins set out to get 100 rejections in one year. You can read her story about this project in a link I’ve provided below. The great thing about her strategy is that it takes something quite yucky — getting rejected — and turns it into something fun, a game! Here’s another interesting bonus: some of her initial rejections turned into acceptances. Overall, she judged the project to be a massive success. Also be aware that it’s always worth managing the biggest scariest critic of all, who happens to be YOU. We are all really good at criticizing ourselves and we all know our own weak spots so these criticisms end up being more acute. Don’t let your own self-criticisms derail your writing plans. The only time you should let your self-critic loose is when you are editing, not ever when you’re writing. Thanks for the question, Tracy. Go out there and collect some more rejections slips! They are your tickets to the game.